ORCHARD PARK, N.Y. (CBSNewYork/AP) — A day after the Jets announced their promising rookie quarterback would miss Sunday’s game with a foot injured, the Bills have pulled their starter from the Week 10 match-up as well. 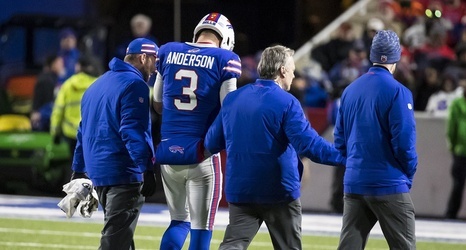 Buffalo Bills coach Sean McDermott has ruled out quarterback Derek Anderson from playing this weekend and continued leaving open the possibility of Josh Allen’s return. Allen, Buffalo’s own highly-touted rookie QB, has missed three games with an injured throwing arm. For the Jets, Sam Darnold has already been ruled out with a strained right foot. McDermott says Allen is progressing well from a sprained right elbow, but would only practice on a limited basis Friday.